For more thorough info on jobs, I recommend Seferaga’s FFIII FAQ and the nitty-gritty stats info hidden in the job section of Arkfullofsorrow’s FFIII walkthrough. 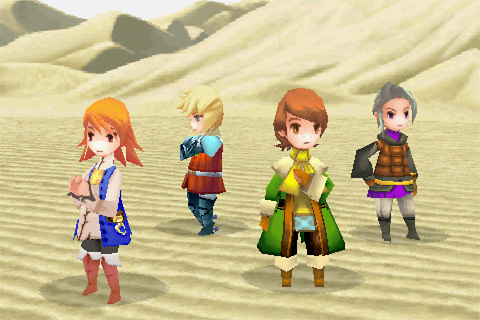 Don’t you wish we could just leave ’em in these adorbs costumes the whole game? Wait, no, that’s what happens in nearly every game after FFV, so that people complain about “dress up” in X-2 and XIII-2. Freelancer can use: Level 1 Black Magic/White Magic, most equipment. Insane stats at high levels make it almost worth leveling up. Almost.